The green superfood is rich in vitamins, minerals and nutritional fiber – and it tastes good too, if you have the right recipe. Organic surprise: What will arrive in this week's delivery of produce? The biggest secret of any chef is not his recipes, but where he buys his ingredients. That's a very big secret, because it is not easy to find them — the vegetables with the strong flavor that were just picked; the fruits whose fragrance reminds us of our childhood; the fish that never saw the inside of a farm pond; the cheese that melts in your mouth; the cuts of meat that passed beneath the tender hand of a butcher who loves his craft. One of my secrets is my vegetable seller on Yefet Street, the last relic of the legendary citron market in Jaffa. Since I found him more than 20 years ago, nothing in his shop has changed. Every morning, he goes out to pick fruit and vegetables from the old plots of land that yield an enormous harvest – produce the way it used to taste, and with the smell of the earth. He carries only produce that is in season and that has been grown locally. Why am I telling you all this? Because two weeks ago I went into his shop to see what was there, and suddenly I saw it. I rubbed my eyes. Kale? What on earth was this trendy food of health nuts, this vegetable portrayed as a superfood, the current hit of every shake and salad, doing here? How did it get to this shop, whose owner firmly refuses to include the slightest sign of modernity? I lifted up the kale. The elderly man, immediately understanding my questioning glance, said simply: "Everybody is asking for it, so I brought it in." I realized that if he was selling kale, it was no longer a trend and I had better make its acquaintance, even though it would not be easy for me. Kale is a kind of ancient cabbage that was domesticated more than 2,000 years ago, becoming one of the most consumed vegetables in ancient times. It belongs to the cruciferous family, which includes various varieties of cabbage, broccoli and cauliflower. Kale has countless varieties that vary according to texture, bitterness, color and leaf shape. When I tried to make sense of them all, I realized that nobody really knew what was what, and that the best thing was to let it go. Kale is kale, and that’s it. Kale has high nutritional value, maximum absorption ability, and proven abilities in healing and disease prevention. It is rich in vitamins, minerals and nutritional fiber, and has dozens of kinds of oxidants and anti-inflammatory compounds. Fresh kale has a tough, slightly fibrous texture. Its dominant and slightly bitter flavor is reminiscent of that of cauliflower leaves. If you want to get the maximum benefit from kale, blend it in shakes or cut it, moisten your hands with olive oil and squeeze it to make it softer. I love kale chips. Tear the leaves into medium-size pieces, rub them with olive oil and your favorite spices, and bake them in the oven until they are dry. You end up with delicate, slightly transparent leaves that are very tasty and with no trace of the tough, fibrous texture. The chips can be eaten with salads, pastas, brown rice and legume dishes. 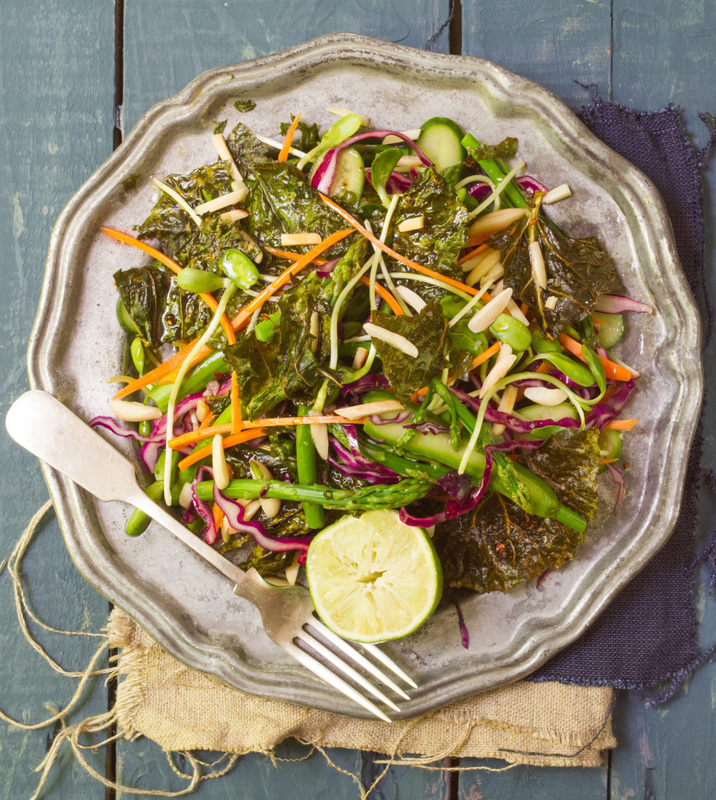 Kale can also be prepared like chard: cut it and stir-fry until it's soft. Then it will blend well into shakshuka, baked dishes, quiches, soups and cooked salads. When buying kale, see how the leaves look: They should be fresh and not wilting, with a deep green hue and not yellowing at the tips. To keep it fresh, store in the refrigerator, wrapped in a clean towel. Preheat the oven to 150 degrees Celsius. 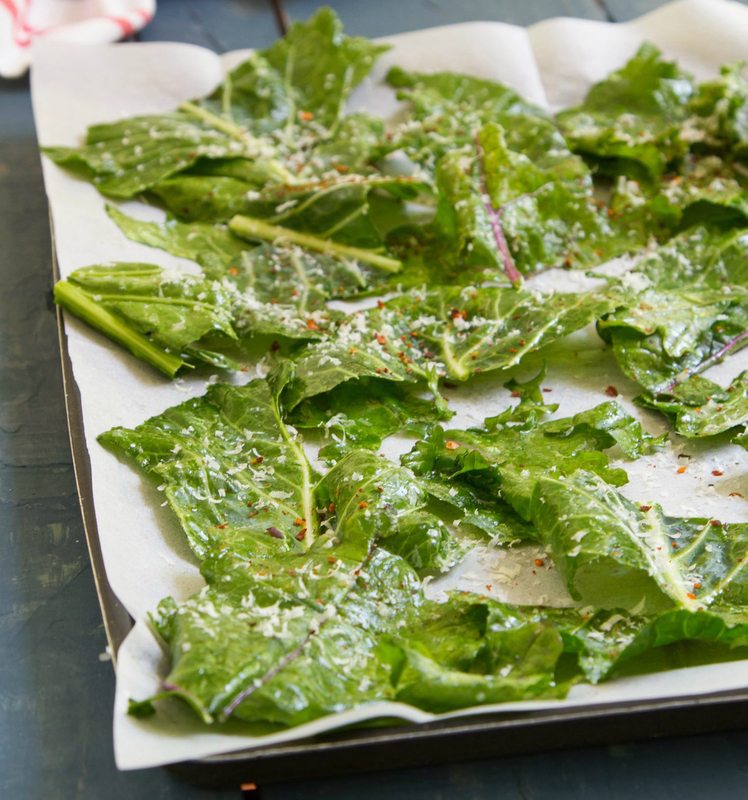 Tear the kale leaves into medium-size pieces and put in a bowl. Add the olive oil and salt, and add your favorite seasoning. Mix well and put in a foil-lined baking pan. Lay the leaves down flat, with space between them. Bake for 20-25 minutes. Add to salads or pastas, or crumble atop whole-grain rice and beans. Trim the bottom third off the asparagus stalks. Place the asparagus in a bowl, pour boiling water on it, let sit for two minutes, then drain and rinse in cold water. Cut the stalks in half. Mix all the salad ingredients together in a bowl, pour on the dressing, toss and adjust for seasoning. Serve with some toasted almonds on top and some extra kale chips on the side.